I am a native of Lincoln and received my Doctor of Dental Surgery degree from the UNMC College of Dentistry. I completed my Pediatric Dental Residency at Children’s Memorial Hospital of Northwestern University in Chicago. 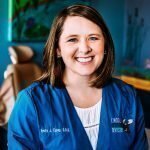 I am a Diplomate of the American Board of Pediatric Dentistry and have been elected a Fellow of the International College of Dentists and American College of Dentists. I am a member of the American Academy of Pediatric Dentistry, American Dental Association, Nebraska Dental Association, and Lincoln District Dental Association. I am a board member of the Lincoln Lancaster County Health Department and Heart to Honduras. I serve on health advisory committees for ExCite and HeadStart. My husband, Todd, and I have two children. We are active in the community, our church, and with mission work in Honduras. I enjoy golfing, swimming, and running.